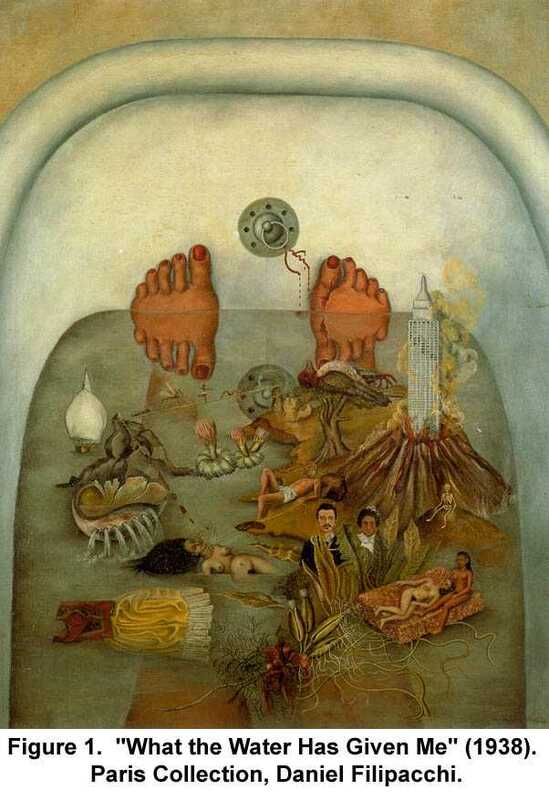 Frida Kahlo is a powerful example of the issues of the Cancer sun-sign. Cancer people are attached to their families and their roots. They need family life and desire to create one of their own, and they have a complex emotional life, in which their past plays a big role. They have a great need for a nurturing maternal protective figure in their lives. However, as many astrologers have observed, the qualities of the sun-sign usually indicate the issues and the challenges that we need to deal with and the lessons we have to learn in this life, rather than our comfort zone. Frida Kahlo’s life and art express these issues almost as a text-book case. Frida Kahlo was born on July 6, 1907, at 8:30 AM in Coyoacán, Mexico. Her father was a Hungarian Jew who came to Mexico at age 19 and became a noted photographer, and her mother was a native Mexican who was illiterate, yet intelligent and very religious. Frida adored her father and was very critical of her mother. In the chart, her mother is represented by Venus and the Moon. The Moon is strong due to its most elevated placement in the 10th House, in the sign of Taurus, which indicates money matters as well as art. To quote Frida: “My mother was hysterical about religion. We had to pray before meals. She did not know how to read or write. She only knew how to count money. Venus in this chart is in a difficult aspect configuration with Pluto and Saturn - a situation that always indicates difficulties in receiving love, and which later also played a big role in her marriage to Diego Rivera. It actually began to manifest soon after she was born, when, at age 11 months, her mother gave birth to her sister Christina, and Frida was given to an Indian wet nurse to suckle. The strong Neptune in the chart also manifested in the fact that this nurse was later dismissed when she was found out to be drinking alcohol. All this would have been a most traumatic abandonment experience to a Cancer baby girl who needed mother desperately. 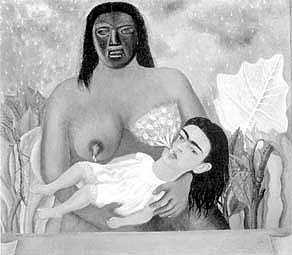 Frida depicted that in “My Nurse And I”. The Cancerian soul is most attached to the breasts that provide nurture, protection from hunger and emotional security. By portraying herself with the adult face she is indicated how this need persisted in her maturity too. Her Cancerian attachment to home and family roots also come through her painting “My Grandparents, My Parents and I”, where she depicts herself as a little girl, standing in the middle of the courtyard of her ancestral home, “The Blue House”, holding a blood-red colored ribbon, that connects her to the images of her grandparents above. Her parents figures are behind her, and as if not to miss on the symbolism, she has a fetus connected with an umbilical cord to her mother’s belly through her dress. This is also a reminder of the miscarriages she suffered later in life - yet another devastation to the Cancer female soul. Her chart has a difficult configuration of Uranus, Mars and Neptune, all combined with the Sun, which is the ‘ruler’ of her Rising sign Leo. The Sun-Neptune indication of delicate health, plus the difficult Saturn-Pluto combination, first manifested itself at age 6, when she contracted polio. She was confined to her bed for nine months, suffering excruciating pain. This also left her with a deformed leg, which she used to cover by wearing long skirts. This experience began the cycles of physical pain and emotional loneliness that haunted her all her life. The Sun-Mars-Uranus combination is often a warning of potential accidents in life, and so, at age 18, it hit with full force in a tragic accident. On September 17, 1925, the wooden bus on which she rode home from school was smashed by a street car. Many bones in her body were broken, her right foot was crushed, her left shoulder was dislocated, her spine and pelvis were injured and a steel rod pierced her body from the hip through the womb. There was little hope that she would live and her shocked parents could barely bring themselves to see her in the hospital. After a month she went home, but her life irrevocably changed. There she was alone and lonely in bed again, coping with this ever-present pain. She went through many months of intensive care and rehabilitation, but remained physically handicapped all her life, undergoing more than 30 operations. Later in life she also suffered a series of miscarriages and abortions. She was confined to bed much of the time and constantly fought her inner crumbling. The injury to her female reproductive organs and the inability to have children was yet one more blow to her Cancerian soul who craved family life more than anything else. 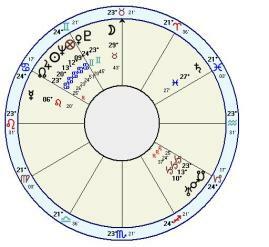 All this was happening when the planet Pluto was at 14° Cancer passing over the Sun in her chart. 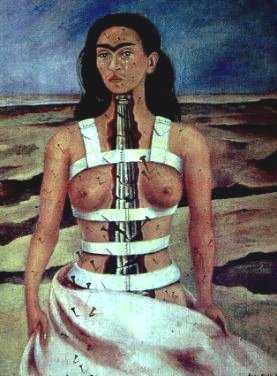 Pluto has the astrological ‘reputation’ of transforming life, and for Frida this was an understatement. It was during this long period of immobility and loneliness that she began to paint, and it was her mother, for whom Frida did not much respect, who was actually instrumental in this. She fastened a mirror to Frida’s bed and provided her with painting materials, and the rest, we might say, is history. Astrologically speaking, this is fascinating, as Frida’s Moon (representing the mother) is in the sign of Taurus which signifies art, and in the 10th House which indicates one’s career, goals and place in the world. Pluto symbolizes death and re-birth, and in Frida’s chart it is configured with Saturn is in the 8th House, portending dangers to life; and so she was able to transform her ‘near-death’ experience into great art. As a matter of fact, the connection between death and childbirth in her life began even before she was born. 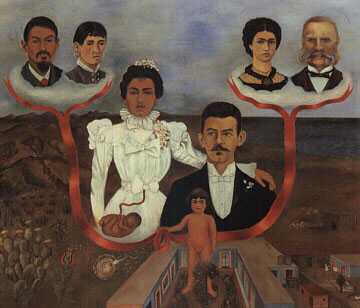 Frida’s mother was her father’s second wife. The first one died at childbirth, and on the night of her death her father called in an acquaintance who arrived with her daughter. He fell head-over heels for the daughter and later married her. The themes of death, motherhood and childbirth are powerfully represented in her painting “My Birth”, where the mother and the fetus, having Frida’s face, are dead and the icon above the bed is of The Weeping Virgin of Sorrows. The planet Uranus also indicates rebellion, adventurous nature, revolutionary ideas, independence and breaking the rules of conformity. Neptune symbolizes idealism, and when the two are combined, as in her chart, they produce the idealist, the social reformer, and the person who will not conform to social norms. That she did when in high-school and university, and later through her collaboration with her husband Diego Rivera, who declared himself communist and got into some artistic trouble in the US because of that, when he was commissioned to paint a mural at the Rockefeller Center in New York City. Neptune configured with the Sun also brings a search for self-identity. The Cancer person is always connected to the family, the clan and the national patriotic roots, and so Frida combined these two themes into wearing the ethnic Mexican clothes. Her Leo Rising gave her a high sense of fashion and drama and her exotic looks always drew attention at home and abroad. Frida's story would not be complete without Diego Rivera. About their relationship Frida once said: "I suffered two grave accidents in my life. One in which a streetcar knocked me down.....The other accident is Diego." The unfortunate fact of life for people with a difficult Venus-Pluto-Saturn chart combination is that they set themselves up to get the relationships that will hurt them the most, and Frida did just that. Frida met Diego Rivera, the famous Mexican muralist, when he was commissioned to paint a mural on the prestigious National Preparatory School where Frida was a student. Playing her rebellious pranks, she was already trying to get his attention back then by taunting and provoking him about his mistress. They met again a few years later, when she came to him seeking his opinion of her paintings. They married on August 21, 1929, to much disapproval from her family. He was twenty-two years her senior, a well-known womanizer and in the process of a divorce. Their marriage has been called the union between an elephant and a dove because Diego was huge and very fat and Frida was small and slender. Their relationship was stormy and tumultuous, as he continued to have affairs throughout the course of their marriage. Her greatest pain and sorrow came when she found out about an affair between him and her dearest sister. Frida was no wall-flower herself, and began to have affairs of her own, partly to get back at Diego and partly to satisfy her adventurous Uranian nature. One of her famous affairs was with the exiled (and married) Russian leader Leon Trotsky. With her Neptune-Sun adding mystique, mystery and a quest for identity, along with her Uranus non-conventionality she was bisexual and had love affairs with women too. Some photographs show her wearing man’s clothes. Georgia O'Keeffe was one of the women she is rumored to have romanced. She explored these other sides of her sexuality and painted herself dressed in man’s clothes, yet Rivera was the love of her life. Diego and Frida divorced in 1939 and remarried in 1940, yet lived in separate houses, with an understanding that each could have romantic involvement on the side. 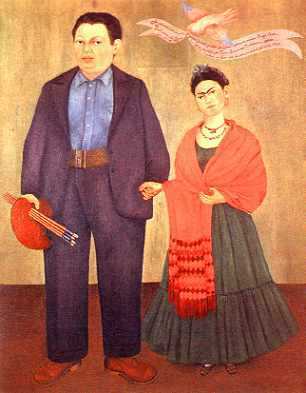 They remained together until Frida's death in 1954. “What the Water Has Given me” comes from the center of her Cancer-Sun soul. This Water sign is instinctively connected with water in both symbolic and physical way, and I have the Impression that Frida was aware of it too. The Leo Ascendant contributed to the focus on the ‘self’. About one third of her work was self-portraits, in her various symbolic and realistic states of being, both physically and emotionally. "I paint self-portraits because I am so often alone, because I am the person I know best." , she said. The strong instinctive imagination coming from her Neptune-Sun is expressed in this quote: "I paint my own reality. The only thing I know is that I paint because I need to, and I paint whatever passes through my head without any other consideration." Frida only had one exhibition in Mexico in the spring of 1953. During the same year as her exhibition, her health drastically deteriorated, which caused her to become deeply depressed. On July 13, 1954, Frida died. Her last words in her diary read "I hope the leaving is joyful and I hope never to return". Frida Kahlo by Hayden Herrera. THANKS: To Miriam Spector, my first teacher, who inspired me to study art in astrology.